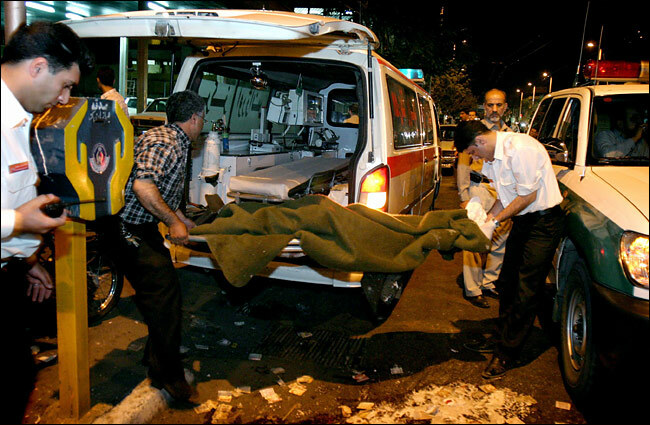 Yesterday's reported bombings in Iran were most likely the work of the Iranian Ministry of Internal Security (MOIS). This would follow the pattern used effectively by the Soviets and aligned nations. The Soviet secret police routinely created "opposition" groups and used them to monitor and infiltrate anti-Soviet activity. They often went so far as to stage bombings, in order to establish the groups' bona fides with Western intelligence services. Iran, similarly, has a long history of infiltrating and controlling Iranian opposition groups, using sophisticated provocation tactics. In the early 1990s, Iranian security services rolled up the CIA's entire agent network in Iran, which, it turned out, had been under Iranian control from the start. With the Bush White House pushing for regime change in Iran, one can posit with near certainty that Iranian intelligence is dangling bogus "agents" and "opposition groups" to the CIA, e.g., the People's Mujahideen Organization, and that these parties are under pressure to "do something." The bombings in Iran are likely intended to show the CIA that these phony groups can indeed "do something" and thus merit continued U.S. support. Typically, when security services stage or incite acts of violence, they do so where the political cost to their own government is lowest. The Iran bombings follow this pattern. 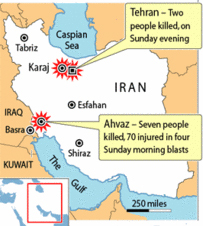 The more damaging explosions, wounding 70 and killing 7, all reportedly occurred in Arab, rather than Persian, parts of Iran. Since the Arab regions are anti-Government, this is rather like anti-Saddam exile groups proving their mettle by bombing Kurdish settlements. The Iranian Government's denials that the bombings even occurred is probably only meant to underscore its alleged "embarrassment" and "lack of control" over events which it in fact has engineered, for the purposes of leading the CIA further down the primrose path. Expect the "opposition" groups behind these bombings to be rolled up before they can pose any effective threat to the regime. Link: Iran denies blast, says threats received.